As cliche as it sounds, another year has flown by. But this year was special because it was Finn's first year of life. I am blown away by the amount of love I have in my heart for this boy. I didn't think it was possible to love so much--and let alone to love three people so much. Colby, River, Finn, and I have had such a beautiful year bonding, creating small moments and big ones, and learning how to adjust to a family of four. Bedtimes are different, road trips are different, and our hearts are fuller because of it. Last weekend we celebrated Finny by having some friends and family over for cake and drinks. (Thank you to our friend Kaleb for taking a few pictures for us!) It was a beautiful, sunny day and I loved imagining what I was doing exactly a year earlier while we waited for Finny to enter the world. When he wants something he makes it known. He loves singing with me. He like to make me laugh. Crawling around is more fun than sitting still while reading a book. He has a contagious sense of humor. Right now we're getting used to the fact that he's not our teeny, little baby anymore. Looking through the photos of his first few months brings back all of those early, newborn feelings. The newness of this little human, sleepless nights, and that smell (oh that sweet new born smell) are just a few of the magical parts of that time. And it's crazy that it actually seems like it was just last week that we were in the thick of it all. 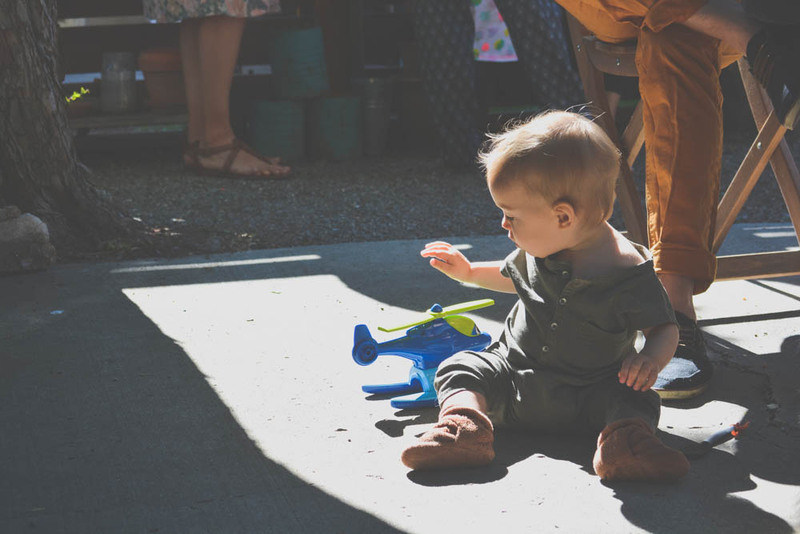 I, personally, had a hard time adjusting to everything after Finn was born. Finding time for both Finn and River was more complicated than I thought it would be. And I was far more exhausted than I was with River. I know that I let the stress of it all get in the way of really being present with my family at times over the last year and I want to make it a priority to make sure that doesn't happen over the next year. May 23, 2017 by Emily Schultz. 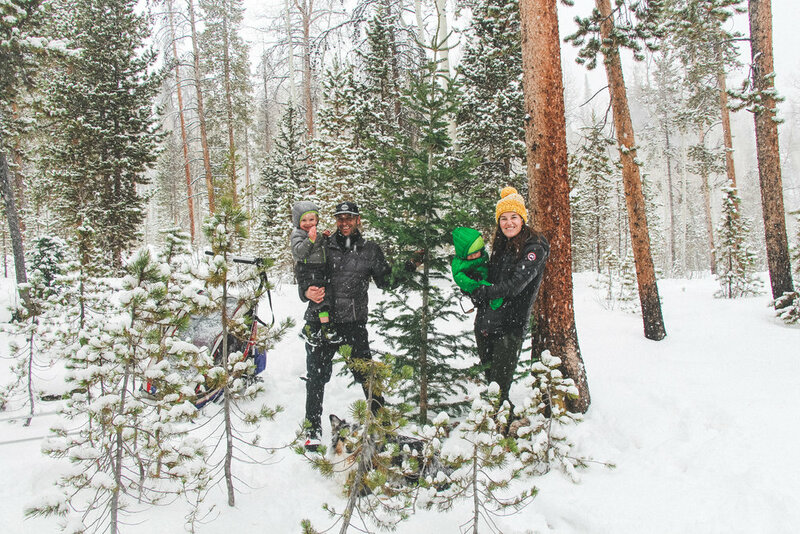 We ventured out to the Uinta forest again this year to find ourselves a little Christmas tree. The ground was covered with just enough snow to make it really feel like Christmas, but not enough to get stuck while walking through the woods without snowshoes or skis (like previous years.) Right after we stopped to get our tree permit the snow started falling and it felt magical. We had planned on River napping during the drive but that did not happen, so our time spent searching was shorter than we had hoped. 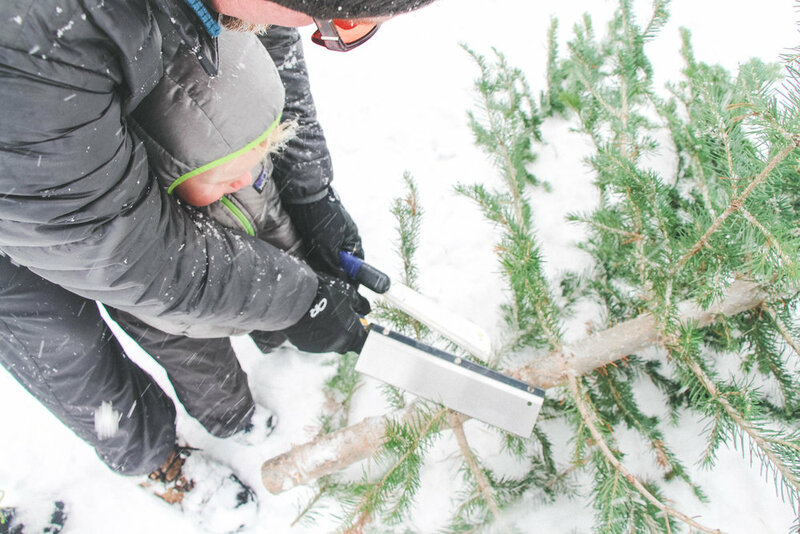 But, luckily, my sister in law found the perfect tree not too long after we pulled off the road. The appeal to eat snow is pretty strong for a two year old, so River's hands got cold fast. After we cut our tree down the snow started to really come down so we headed back to the van for our leftover turkey sandwiches and hot chocolate. November 29, 2016 by Emily Schultz. Earlier this year we welcomed our little baby boy, Whitman Finn Wade, into the world. To merely say that our lives changed would be an understatement. Colby, River, (even Hank), and I were waiting anxiously to meet our babe and find out if it was a boy or a girl. When Colby told me the news as he entered into his arms all I could say was, "My sweet boy, my sweet baby boy..."
It's funny how you can paint a picture of the future in your mind and think you are headed for a certain path -- Colby and I were both convinced we were having a girl -- and then when that picture turns out to be different, you realize it was in your heart that way all along. I am excited beyond words to spend my life raising two beautiful, caring, strong, loving boys. If one feels the need of something grand, something infinite, something that makes one feel aware of God, one need not go far to find it. I think that I see something deeper, more infinite, more eternal than the ocean, in the expression of the eyes of a little baby when it wakes in the morning and coos or laughs because it sees the sun shining on its cradle. The afternoon that we were able to introduce Finn to River will be one of the happiest days of my life. Finn presented River with a couple small gifts and River was able to give Finn his FiFi (a little giraffe lovey similar to his puppy). Their journey thus far has been challenging but awesome. River is learning what it means to be gentle and Finn is learning not to pull hair, but regardless they are on this adventure together and I am so excited to help them and watch them cultivate a relationship with each other. Finn has been such a joy and every day I am reminded of the beautiful, breathtaking, heartbreaking, exhausting, and rewarding role that is motherhood. Thank you to my friend Hannah for taking these beautiful photos. November 23, 2016 by Emily Schultz. I love being a mom. It has been such an amazing feeling to experience and I regret none of it. There are so many moments where all the stars align and we are all getting a long and everyone is behaving and happy. And then there are those moments when I am pulling out my hair, trying not well up with tears, and wondering how I'm going to make it through the rest of the day. Luckily, these moments are fewer and farther between. But, they do happen. And in those moments I am always scrambling to think of something fun for River to do to redirect him from whatever might be setting off his two year old emotions. I try to think of one planned activity a day that we can do at home to take up a little time. Sometimes River isn't super interested in whatever I've planned and sometimes he is. This was one of the days where he was and I was stoked. After breakfast I did the dishes (so it was already destined to be a good day) and I walked passed the empty sink and thought to myself, "Hmmm, this might work..." I've made morning baths for River before so he could splash around and play and he enjoyed them but I had to go check on him every couple of minutes to make sure he was playing safely. So it didn't really create any time for me to accomplish things around the house. I decided to throw him in the sink because it was right in the middle of the kitchen and I could work at the table while he played. I brought in some of his favorite bath toys and left some of my pumping bottles in there and he loved filling them up with water and dumping them out again and again and again. 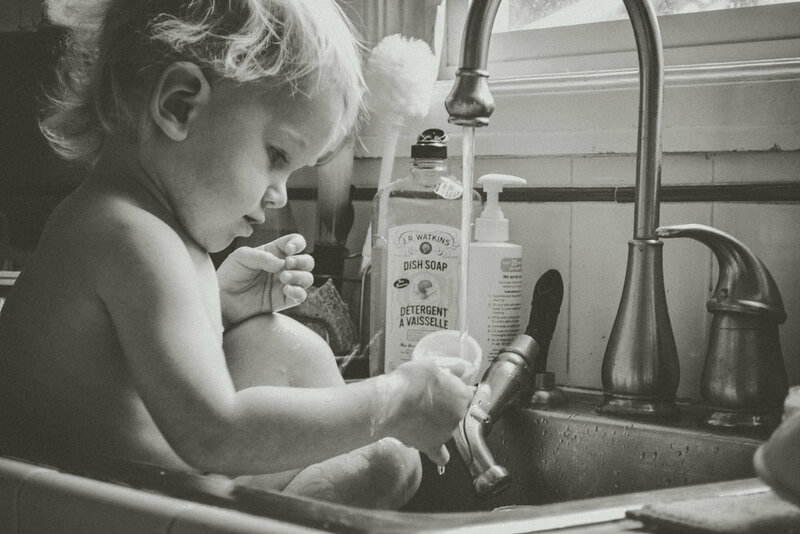 I turned the sink on really low, let it fill up and we'd empty it every few minutes and start it over again. These sweet, quiet moments are so special and I love finding activities that are calming and fun--for both of us. September 17, 2016 by Emily Schultz.